Available Sizes/Colors: Size "M (7-8)"
Let your little girl live her dreams in this licensed Princess Merida costume from Pixar's movie Brave. Child size costume includes blue satin dress with gold trim, character cameo, and gold belt. By Disguise. 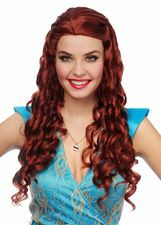 See more options in our Disney Costumes sections!